When people first learn about The Book of Mormon, our missionaries will generally ask them to do 3 things: Read it, think about it, and ask God with real intent if it is what it claims to be. The promise is that at some point and in some way, God will answer that prayer through the Holy Ghost. That should make sense to any Christian. We believe God answers prayers. Some people understandably have a big problem with that because “Feelings” shouldn’t be a valid indicator of truth, right? I mean, pizza makes me feel joy, but that’s probably not from the Spirit… riiight??? The first point that I just want to get out of the way is that feelings, to a certain extent, are indeed a valid source of communication and even truth. For example, if you suddenly feel an intense pain in your gut, your body is telling you that there’s something wrong. That’s the truth, even if you have no other evidence to corroborate that yet. That feeling is the evidence. If it’s serious enough, it could mean the difference between life and death. But of course, there are plenty of feelings that are meaningless or just a product of your own biases or whatever you had for dinner. The crucial factor is discovering the source of the feeling. Is it a ruptured spleen? Because that’s important. A funny joke? Less important. The Spirit of God? Very important. We’ll try to do a whole episode in the future about differentiating between what comes from the Spirit and what doesn’t. On the day of Pentecost, we read that the people “were pricked in their heart.” Even non-Latter-day Saint websites describe how the Spirit can provide you with an “inner knowing” also curiously described as a “gut feeling” about something. You don’t just have to be a Latter-day Saint to feel that. It’s available any time anyone takes a step towards Christ. But if someone tells you that Latter-day Saints just want you to do whatever your feelings dictate, that’s wrong! It’s more than a feeling. Remember the first two steps of the Book of Mormon challenge? Read it and think about what you’ve read. There’s very much-so an element of sincere study involved. You can’t just skip straight to asking God, hoping He’ll do all the work. The Book of Mormon itself teaches us to “experiment upon [the] word and to exercise a particle of faith.” If the experiment yields the promised results, then you’ve got something there. The main argument against the “spiritual confirmation” method of learning truth is that truth should be based solely only upon empirical physical evidence. And physical evidence is great, but looking for physical evidence in regards to spiritual matters is sort of like trying to learn about apples by researching oranges. For example, how do you know the Bible is true? Many people believe it’s true because of the archaeological evidence available. Many others believe it’s false because of the lack of evidence. 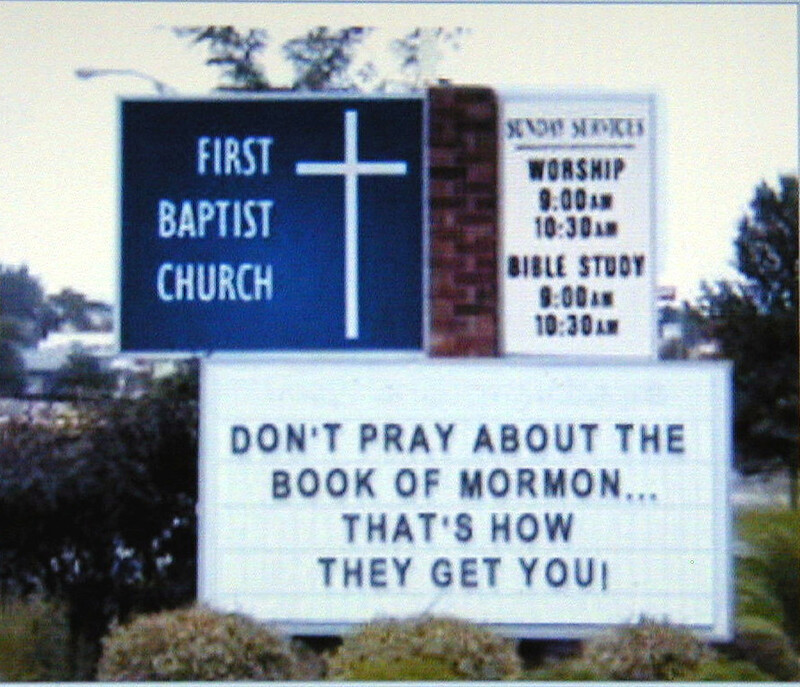 The same is true for The Book of Mormon. Besides falling into the circular reasoning of “the Bible says so,” can you prove that Moses spoke to a burning bush? Can you prove that Christ changed water into wine? Can you prove that Christ was resurrected? If not, then why do you believe it? Because if we’re relying solely upon empirical evidence, shrubbery doesn’t talk. Water can’t decide to be wine. Dead people stay very dead. My guess is that you too have experienced this spiritual “inner knowing” that we’ve been talking about. The Holy Ghost has testified to you that even though you weren’t there, this stuff happened. For more info on this, check out the links below. I’ve mainly been addressing a Christian audience, if you’re not religious you probably considered most of this video invalid, but hopefully, some of the resources below will speak more to you. Have a great day! As members of The Church of Jesus Christ of Latter-day Saints, it’s pretty interesting to read a sentence like the one in the image above. We all have been encouraged to get our own confirmation from God that the Book of Mormon is true, that Jesus is the Christ, that Joseph Smith was a prophet, and that a prophet leads the Church today. Confirmation from God is different for every individual, and many have received profound, miraculous experiences, while others have had a sweet assurance imprinted on their very souls. These experiences are meant to anchor our faith. How do We Know that It’s God Answering and not Satan? Joseph Smith was a boy of 14 when he went to the woods to pray vocally to God. He was confused about which church he should join and also unsure about where he stood in his own worthiness before God. He had a frightening experience that began the second he opened his mouth to pray. It no sooner appeared than I found myself delivered from the enemy which held me bound (Joseph Smith History). Joseph Smith’s prayer initiated a personal visit from the Father and the Son. An answer to your prayer about the truthfulness of the Book of Mormon might not be so miraculous, but it will come in a way that you will always remember…if you pray with real intent. What Does it Mean to Pray with Real Intent? And when ye shall receive these things, I would exhort you that ye would ask God, the Eternal Father, in the name of Christ, if these things are not true; and if ye shall ask with a sincere heart, with real intent, having faith in Christ, he will manifest the truthof it unto you, by the power of the Holy Ghost. A person who prays with real intent is willing to ACT UPON the witness he receives. By moving forward with faith, he or she manifests a willingness to receive God’s gift and be worthy of receiving more. New converts to The Church of Jesus Christ of Latter-day Saints often make great sacrifices to act upon the witness they receive. They align themselves with the Word of Wisdom and give up coffee, tea, alcohol, cigarettes, and recreational drugs. They align themselves with the Law of Chastity. They are sometimes abandoned by their family and friends. Some even lose their jobs. But those who move forward in faith find that good things begin to happen. Family and friends mellow and some even join the Church. Happiness increases from living the commandments and becoming morally clean. Watch a few of the conversion stories available at the Saints Unscripted YouTube channel to witness some of these journeys. That’s right, they do! God will lead you along to draw closer to Him with these experiences, so any path that draws you to Christ can bring these sorts of manifestations from the Holy Ghost. Receiving confirmation that the Book of Mormon is true, however, leads you to a higher place—more knowledge, more authority, more power, more truth, and even more happiness.